Stryi Regional Studies Museum Verkhovyna [Стирийський краєзнавчий музей «Верховина»; Stryiskyi kraieznavchyi muzei ‘Verkhovyna’). A regional studies museum founded in Stryi in 1932 through the efforts of Roman Dombchevsky, O. Siletsky (its principal collector), Olha Bachynska, T. Zalesky, and I. Maksymchuk, in 1937 it had 2,000 items on exhibit. It was nationalized by the Soviet occupying authorities in 1939 and reorganized after the Second World War. 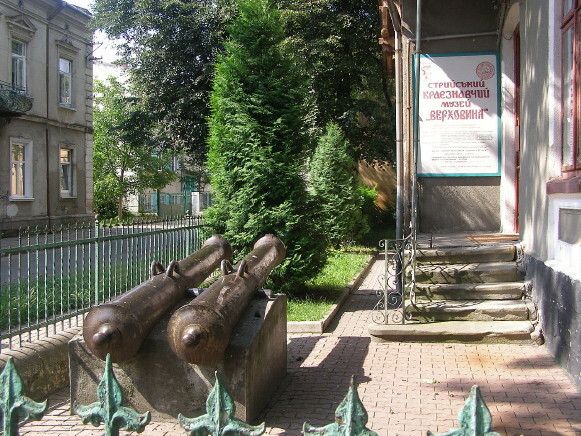 The museum has natural science, ethnography, and history divisions and holds 26,000 artifacts, including local archeological finds, 15th- to 20th-century historical documents, 17th- and 18th-century weapons used by the Cossacks and opryshoks, 14th- to 16th-century coins, late-19th- to early-20th-century Boiko region and Hutsul region Easter eggs, 19th-century folk musical instruments, 18th- to 20th-century traditional dress, and 19th- and 20th-century books and periodicals. A special exhibit is dedicated to the history of the Ukrainian Insurgent Army.